Tony Parker made two clutch free throws in the final minute to lead Bruins over Alabama. LOS ANGELES (AP) — Tony Parker scored 16 points, including two free tie-breaking free throws with 56.8 seconds remaining, leading UCLA to a 75-67 win over Alabama Saturday night. 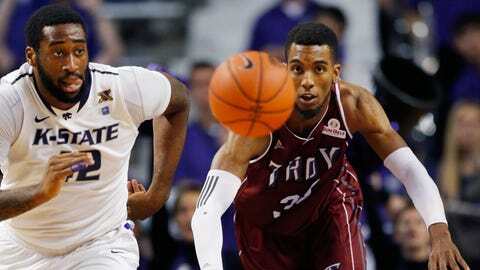 The Crimson Tide (5-7) was led by Trevor Releford, who scored a season-high 34 points. He scored five consecutive points down the stretch, tying the score at 67 with 1:24 remaining in the game. Parker’s free throws gave the Bruins a 69-67 lead. They then scored their remaining points at the free-throw line. 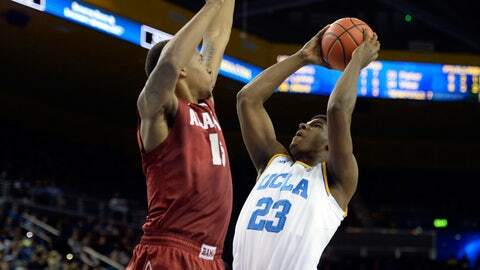 UCLA (11-2) has spent the early part of the season playing strong in the first half, only to hang on in the second. Trailing at halftime for the first time this season, the Bruins were forced to play better in the final 20 minutes. The Bruins scored the first six points of the second half to take a 39-34 lead but the Crimson Tide responded with nine straight points by Releford. UCLA then reeled off 10 consecutive points to take a 49-43 lead. They never trailed again, though Releford single-handedly kept things a little too close. The Bruins had a chance to put the game away in the first half but couldn’t do it. UCLA used a 12-2 run to build a 20-9 lead in the first half, doing so while Releford sat on the bench. Releford, who entered the game as the Crimson Tide’s leading scorer with a 17-point average, didn’t start Saturday’s game because of disciplinary reasons after being late in returning to the team after the Christmas holiday. Releford entered the game with 14:20 left in the first half and took a few minutes to get used to the court. Once he did, however, he led the Crimson Tide back into contention. Alabama erased its deficit by rolling off nine consecutive points. Releford scored seven of them. UCLA point guard Kyle Anderson ended UCLA’s scoreless drought, which lasted 5 minutes, 14 seconds, when he sank a pair of free throws. Alabama scored the next three points to close their deficit to 22-21 before the Bruins ended a field-goal drought that lasted 6:31. That streak was snapped when Travis Wear grabbed the rebound on Jordan Adam’s missed shot and scored, putting the Bruins up by three points. Releford, the younger brother of former Kansas standout Travis Releford, followed with two straight 3-point baskets that gave the Crimson Tide a 27-24 lead. Baskets by Adams and Anderson put the Bruins back in front but a free throw by Shannon Hale with 31.4 seconds remaining in the first half gave the Crimson Tide a one-point lead at the break.